LiquidVPN Review 2019 – How Good LiquidVPNs Customer Service? 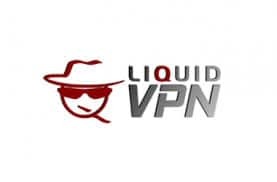 Mandee Rose | Posted on March 16, 2018 February 12, 2019 | Leave a comment on LiquidVPN Review 2019 – How Good LiquidVPNs Customer Service? 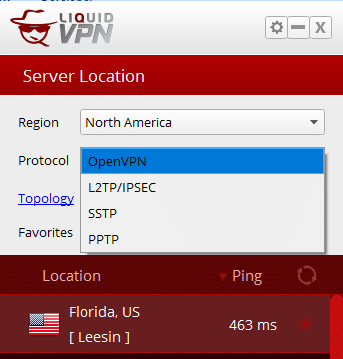 LiquidVPN is a US-based privacy service that started up in 2013. The company started off with just four servers, but has added on locations as the development of the service allowed. The server network is still relatively small. However, customers enjoy a high level of service. The company was founded (and is still run) by Network Engineer Dave Cox. Being led by a technician puts technical excellence at the heart of the company’s business plan. After completing the task of setting up the Virtual Private Network (VPN) service, Cox turned his attention to the creation of “modulated IPs,” which is one of the topologies that LiquidVPN now offers. This is a cloaking method that is unique to the company. LiquidVPN fits somewhere in the mid-to-low price bracket for the VPN industry. The SideKick plan, when bought on an annual subscription, is just over half the price of ExpressVPN, which is the industry leader. However, ExpressVPN has a server presence in 94 countries, compared to LiquidVPN’s 11. Subscribers only have to give a name and an email address, plus pay with bitcoin, PayPal, or a credit card. You can sign up to a webmail account to preserve your anonymity. Using bitcoin for your payments would also help hide your identity. What Features does LiquidVPN Have? A choice of plan with two, four, or eight simultaneous connections allowed. The main security feature of the LiquidVPN app is the ability to specify a VPN protocol from within the main server selection area of the interface. This is rare among VPNs, and makes it very easy to play around with different VPN methods. The 4096-bit RSA key for session establishment is important because it has recently been discovered that the Chinese authorities can crack lower-grade encryption for key exchange. This phase of a connection distributes the common encryption key that will be used for the remainder of the session. If someone can get hold of that key, none of the data transferred with it is secure. The distinctive feature of LiquidVPN is the different configurations of IP addresses that it offers. Most VPNs use a shared IP address for communications between your computer and the VPN server, which means that every connection to that server is sent to the same address. 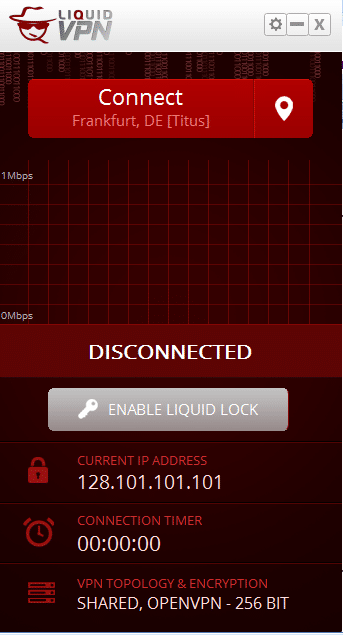 LiquidVPN offers this service and also has a pool of public IP addresses. The public IP option means that the server presents itself by one IP address in a connection to your computer, but only your computer connects to that address during the session. The server will be connected to other clients during that time, but those others, if also on the public IP address, won’t be sending their traffic to the same address. This option is also known as a dynamic address. In this system, the temporary IP address that you are allocated carries through on connections to the destination server. When you disconnect from the VPN, the IP address goes back into the pool to be allocated to other customers. The modulating IP service is the invention of the company’s owner, Dave Cox. This switches the IP address that your computer uses, not just after a time period expires, which is what an IP switcher would do, but for each connection request. Each webpage is compiled from a collection of files, so as your browser assembles the contents to mark up on your screen, it will actually use a different IP adrress to request each element. For example, each image on a webpage is stored in a separate file and the modulator will request each of those images by using a different IP address. This cutting edge IP switching worried me a little. Most regionally restricted sites work hard to detect and block VPNs. The modulated IP seems to flag VPN technology. So, I tried getting into Netflix with modulation selected on the VPN. Netflix has one of the most stringent VPN detection systems in the business, and so, if a VPN can get past that, it can get into any streaming site. The modulating IP address didn’t alert the proxy detection procedures of Netflix. As a rule of thumb, LiquidVPN recommends using the public IP address if you access from your computer with a firewall. However, if you are on a smartphone or tablet without local firewall protection, you would be better off accessing the LiquidVPN network and hiding behind the NAT firewall offered by the shared IP address. The company is based in Michigan in the US. This is not an ideal location for a digital privacy service, because the US government’s security services are notorious for snooping on their own people. The location could also be a problem for copyright infringement cases. US copyright lawyers have taken digital services companies to court to force them to reveal their clients’ activities. This is a particular threat to those who like to use torrent downloading networks. The company’s server network is probably the one aspect of its service that might put you off. It is one of the smallest networks in the business. There are plenty of servers in the US and also some in Canada. You can choose to connect to servers in the UK, the Netherlands, Germany, Sweden, Spain, Switzerland, the Czech Republic, and Romania in Europe. There is also one server in Asia, which is in Singapore. If you want to get past regional restrictions, you need to select a VPN server in the same country as the service that you want to access. Therefore, you might find that LiquidVPN is not for you, because it just doesn’t have a server in the county that you want to access. Click on the “Sign Up” button beneath you chosen plan in order to get the purchase process started. In the first section of the order screen, you can select whether you want to take out the service for one month, or pre-pay for a year. The yearly subscription has a much lower price. Enter your name, email address, favored password, and payment method (PayPal, bitcoin, or credit card), then check the terms and conditions box before hitting the “Complete Order” button. I paid with PayPal, so I next had to log into my account there in order to complete the purchase. 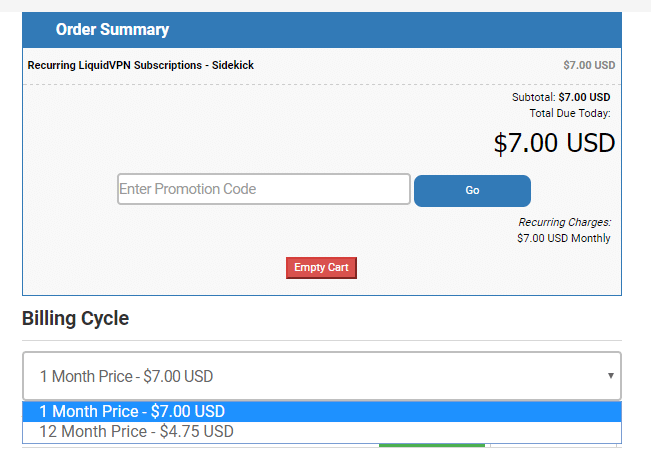 Cheekily, LiquidVPN sets up a repeat payment schedule on your account, so if you only want to sign up for one month, you need to cancel the billing agreement before the company accesses your account and charges you for another month. If you pay with PayPal, you can cancel the recurring element of the payment immediately without reversing the payment for the current month. Thus, your one month of service will continue and you won’t have to worry about missing the re-charge date. 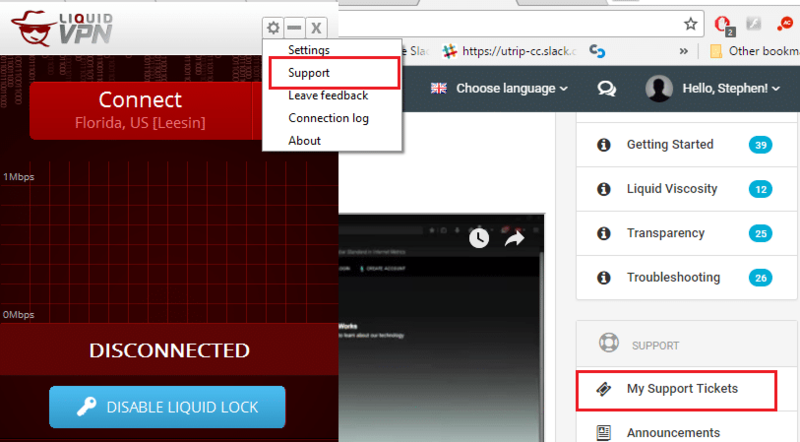 Liquid VPN automatically logs you in to the website’s Client Area from this point on. When the payment completes, the system takes you to an order confirmation page. This contains a link to the download pages that you need in order to install the client software. These software files are also available in the User Dashboard at the site’s Client Area. You don’t need to worry about remembering your VPN username and password, because you can also access these in the dashboard by clicking on the name of your subscription. Despite the presence of a download link for iOS in the order confirmation screen, there isn’t a self-installing app available for Apple mobile devices. Instead, you need to go through a complicated process of generating an app by downloading software onto your computer from the OpenVPN organization, then following instructions on the LiquidVPN website to get it operational on your smartphone or tablet. Windows, Mac, and Android users are a lot luckier. Click on the Download link in the dashboard menu to expand it out. A download will start automatically after you click on the entry for your operating system. Click on the downloaded file to get the installer to start. Simply click on the Next button in each screen to get the program on your computer. When you click on the Finish button at the end of the install process, the app will open. The installer creates a shortcut on your desktop. If you already have the VPN client running but minimized, you can open it again by clicking on its icon in the service tray of your desktop. The app has a mobile-friendly design that makes the most of restricted space. The layout of the app is the same, even if you use it on your PC or Mac. This consistency of design means that it is easier to hop from one device to another and still have the same interface to deal with. The app opens with a default configuration, which includes a server selection and the VPN protocol type. You can choose a server by clicking on the map marker symbol at the top of the app. After selecting a world region from the drop-down list at the top of the server screen, you will be presented with a list of available locations. The list of possible servers will change depending on whether you choose a shared, public, or modulated IP address topology. This is because not all of these options are available on every server. You can play around with the VPN protocol that operates on the connection in the server selection screen. As a rough guide, you are better off sticking with OpenVPN. Some people prefer to use PPTP or L2TP for gaming, because these are quicker services. However, LiquidVPN has announced that it will soon be removing the PPTP option from its service. Click on a location to get that server cued up in the main screen of the app. 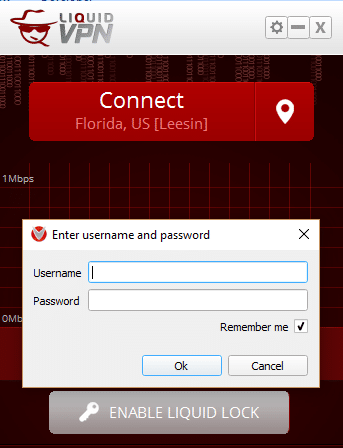 The first time you try to connect, you will be prompted for your username and password. These credentials are not the ones you set up when you subscribed to the service. Rather, they are generated at the time that your payment is confirmed. You access these credentials from within the User Dashboard of the Client Area. Make sure to click on the “Remember me” checkbox so you won’t have to enter these details again. 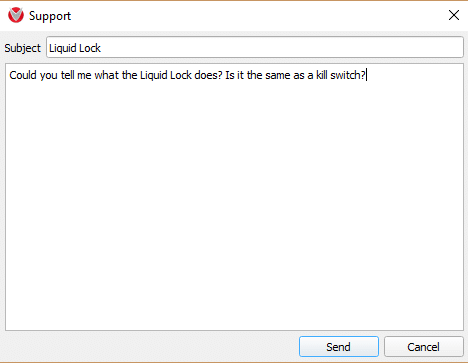 Be careful how you use the Liquid Lock. This is a kill switch and it prevents your computer from connecting to the internet if you don’t have the VPN turned on. If you have the app open, but it is disconnected, your WiFi connection status will say that there is no internet service. This feature is great for those in repressive countries who need to be sure to connect to a VPN at all times when surfing the web, but it can cause panic if you suddenly notice that your internet seems to have stopped working. You can access the support team either from the cog menu at the top of the app or by clicking on “My Support Tickets” in the dashboard on the company website. In the app, you can send a quick message via a simple web form. You will immediately receive an automated email from the support center with a link to the ticket in the dashboard. You can access the status of your request by clicking on its headline in the dashboard. 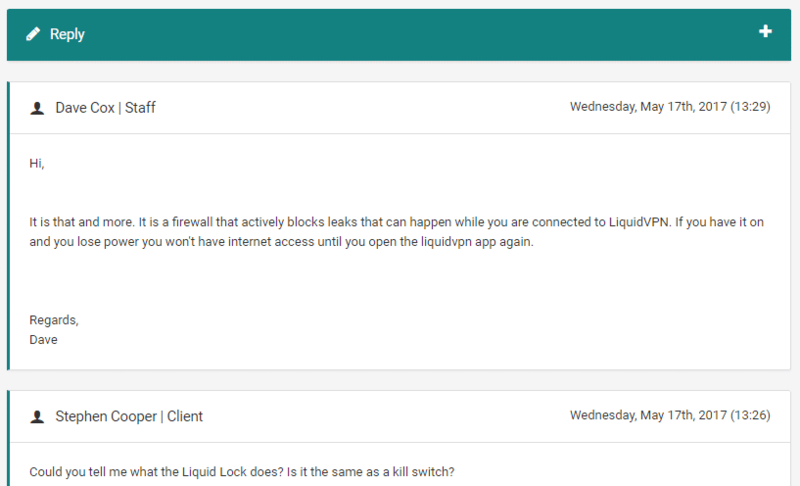 When you receive a reply to your query, LiquidVPN will send you another email. The headline for the support ticket in the dashboard tells you whether the ticket is still open, or has received an answer. Live chat for support would be a nice feature. However, my request to the support team got a reply within minutes, so it is almost instantaneous. VPNs can often speed up a poor connection. These tests were performed with speedtest.net from the Caribbean, where connection speeds are usually between 2 Mbps and 3 Mbps. It is important to note that some local Internet Service Provider (ISP) services have variable performance. Small changes in the performance of the line when you apply the VPN service could just be down to traffic on your local line. These speeds are in the same ballpark as an unprotected connection, so it seems that LiquidVPN neither slows down, nor speeds up connections. The results on the connection to London with a UK LiquidVPN server applied had similar results. 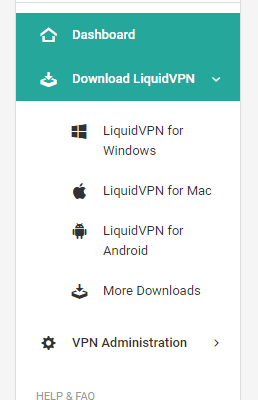 Should I Subscribe to LiquidVPN? LiquidVPN has a very small server network, so your decision on whether to subscribe will greatly depend on the countries from which you want to access regionally restricted content. The company is fine with customers using the application for torrent downloading and doesn’t apply bandwidth restrictions to any specific application or activity. I tried the US server and it got me past the regional restrictions and VPN detection systems of Netflix and ABC. While I had a LiquidVPN server in the UK mediating the connection, I was able to get into Netflix UK and BBC iPlayer without problems. Unfortunately, the slow connections from my location make watching HD streaming difficult. HBO only streams in HD and it recommends a minimum of 3 Mbps on the line in order to watch its service comfortably. 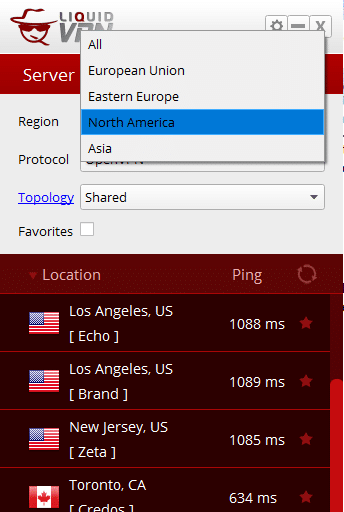 LiquidVPN’s ability to get into streaming services would thus be greatly enhanced if it could also find a way to boost the speed of poor local connections.